All you have to do is use this CORRECTED BALCONY SCENE SCRIPT., divide your group into Romeos and Juliets, and read the scene chorally. As shown in the photo to the right (performed at the University of Northern Colorado in February), the definition of a balcony is very loose. It can be a stage in the school auditorium, the top row of the bleachers, the roof of a building, chairs in the cafeteria, or what you will. The photo below was taken at the Folger Library’s Flash Mob during the April 6 birthday bash and open house. We will be posting all the submitted videos on our own YouTube page. While this is not strictly a competition, we will acknowledge and award entries in a variety of categories such as most creative or unusual setting, best costumes, most passionate or whatever else we think of at the time. Just be creative and have fun! You need to use the Official Edited Script of the CORRECTED BALCONY SCENE SCRIPT that we’ve posted here. It takes about 3 1/2 minutes to perform. A scene from Romeo and Juliet. By John Massey Wright. Folger Shakespeare Library. In an earlier post we wrote about the Balcony Scene Flash Mob in Boston that broke the record previously held by the University of Northern Colorado. We’re hoping some group will break the record of 160 “actors” this month, so consider this a challenge. But even if your “mob” consists of 20 fifth-grade students or a group of senior citizens at the local assisted living center or a class of theater kids at the local mall, we want to see it. And if you can get any local media to cover your mob event, let us know that too. 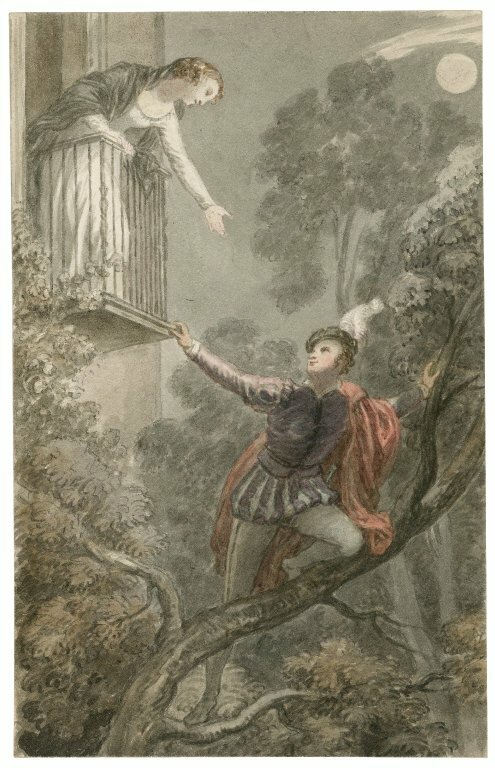 And be sure to check out our Romeo and Juliet board on Pinterest for a collection of beautiful images and famous quotations from the play. Um, guys? Love the idea, and a big mob will be forming in Ottawa, Ontario, Canada. But I thought you might like to have it brought to your attention that a small line-break error in your official script has migrated one of Juliet’s lines backward into Romeo’s preceding utterance. See where “I have no joy of this contract tonight” shows up before the line our dear Will directed it to follow? Potential chaos! At least where Romeos and Juliets who are well acquainted with the script mix with counterparts who aren’t. Thanks for catching that, Rachel. I’ll be fixing it and resending it. I can’t wait to see your mob. Thanks, Mike, that’s great. I’m looking forward to the event. Our mob is being organized by A Company of Fools.